Using ESO's Very Large Telescope, an international team of astronomers has discovered a stunning rare case of a triple merger of galaxies. This system, which astronomers have dubbed 'The Bird' - composed of two massive spiral galaxies and a third irregular galaxy. The galaxy ESO 593-IG 008, or IRAS 19115-2124, was previously merely known as an interacting pair of galaxies at a distance of 650 million light-years. But surprises were revealed by observations made with the NACO instrument attached to ESO's VLT, which peered through the all-pervasive dust clouds, using adaptive optics to resolve the finest details. Underneath the chaotic appearance of the optical Hubble images - retrieved from the Hubble Space Telescope archive - the NACO images show two unmistakable galaxies, one a barred spiral while the other is more irregular. The surprise lay in the clear identification of a third, clearly separate component, an irregular, yet fairly massive galaxy that seems to be forming stars at a frantic rate. 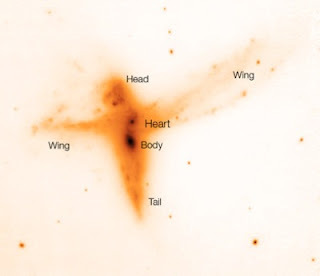 Because of the resemblance of the system to a bird, the object was dubbed as such, with the 'head' being the third component, and the 'heart' and 'body' making the two major galaxy nuclei in-between of tidal tails, the 'wings'. The latter extend more than 100,000 light-years, or the size of our own Milky Way. 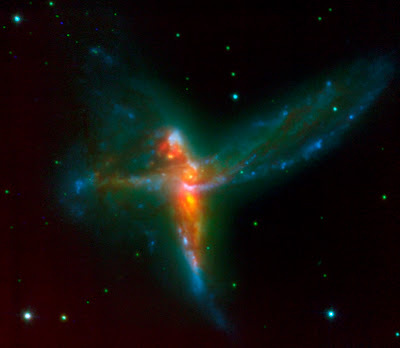 Subsequent optical spectroscopy with the new Southern African Large Telescope, and archive mid-infrared data from the NASA Spitzer space observatory, confirmed the separate nature of the 'head', but also added further surprises. The 'head' and major parts of the 'Bird' are moving apart at more than 400 km/s (1.4 million km/h!). Observing such high velocities is very rare in merging galaxies. Also, the 'head' appears to be the major source of infrared luminosity in the system, though it is the smallest of the three galaxies. The 'head' is forming stars violently, at a rate of nearly 200 solar masses per year, while the other two galaxies appear to be at a more quiescent epoch of their interaction-induced star formation history. The 'Bird' belongs to the family of luminous infrared galaxies, with an infrared luminosity nearly one thousand billion times that of the Sun. This family of galaxies has long been thought to signpost important events in galaxy evolution, such as mergers of galaxies, which in turn trigger bursts of star formation, and may eventually lead to the formation of a single elliptical galaxy.